Aluminium is the most abundant metal in the Earth's crust but, because aluminium was isolated experimentally only in 1827 and produced in commercial quantities only after 1886, its production and use is many times less than that of iron. However over twice as much aluminium is produced as copper and the annual percentage growth in its consumption between 1985 and 1998 at 2.8% is significantly greater than that of iron and steel. The aluminium industry provides an in-depth overview of the international aluminium trade at the turn of the millennium. Its clearly presented information, analysis and statistics bring the industry into sharp focus – from extraction and refining to applications, markets, prices and future trends. 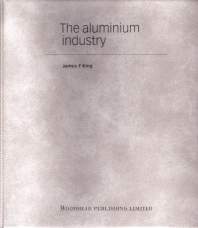 The metal and its history; Bauxite; Alumina; Primary aluminium; Secondary aluminium; Aluminium products; Applications of aluminium products; Organisation of aluminium supply; Issues for the future; Appendices.